One evening a few months earlier, I had been chatting at a local bar with my friend Abdou when the conversation turned to literature. "I'm reading this amazing book!" he exclaimed. Assuming I wouldn't know the book or its author by name, he launched straight into an explanation: It was the incredible, inspiring, true story of a moudjahida—a female combatant who fought for Algeria's independence from France. 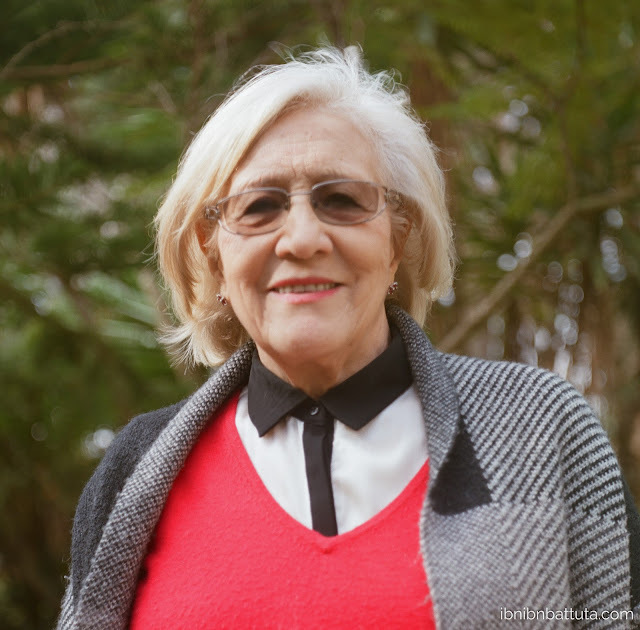 Though she hailed from a small provincial town in Algeria's interior plains, she had made it to the capital, Algiers, to study law in the mid-1950s, just as Algeria's war of national liberation was beginning. Determined to help her people achieve their freedom from the French colonizers, she and several other courageous young women worked their way into the inner circle of the National Liberation Front and—while stretching their society's strict gender roles to new limits—helped plan and carry out some of the movement's most important early attacks. 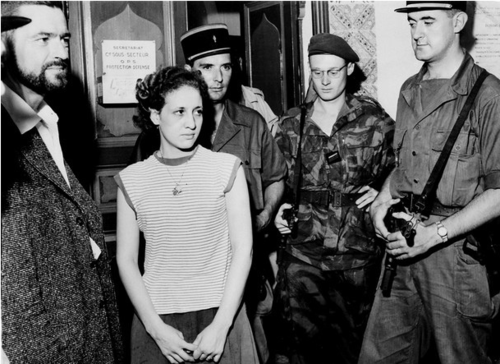 Where before the French had been able to brush aside the struggle as mere "domestic incidents", these attacks focused international scrutiny onto Algeria, finally giving the revolutionaries a foothold to begin turning global public opinion in their favor. I listened quietly as he recounted her brave exploits, patriotic defense of the liberation struggle, and withering denunciation of the French colonial system—until he noticed the grin stretched wide across my face. "Wait, have you read it?" he asked. "You could say that," I smiled. In fact, just a few weeks earlier, I had submitted the first draft of my English translation of that very memoir to Just World Books, the American publishing house that Madame Drif had selected to publish the translation. For the preceding 18 months—including the entirety of my whirlwind year of 2016—I had spent nearly all my free nights and weekends wrangling with the translation, page after page, sentence after sentence, word after word. But why did I spend so many months declining invitations, toiling late into the night, and perfecting my translator's tan? The idea was first proposed to me back in January 2015 by two of my closest friends here in Algiers, Madame Drif's son Khaled and daughter-in-law Leah. I was thrilled about the possibility from the very first mention, and devoured the book before plunging myself into a passionate sample translation of a favorite passage. This project would, I rightly guessed, be a once-in-a-lifetime opportunity to work closely with a renowned historical figure, helping to tell her story to a world audience that knows relatively little of Algeria. Since my first visits here to Algeria, I recognized that nobody back home in the US knew much of anything about the place—the largest country in Africa and a beacon in the third world anti-colonial struggle. Sadly, when an outsider does know something about Algeria, so often it was transmitted through the distorting lens of the former French colonizers. I have come to see the wider world's ignorance of the country, its history, and its cultures as a tragic missed opportunity for Algerians and foreigners alike. Instead of counting on their one-time oppressors to do it for them, it's high time for Algerians to tell their own stories to the outside world. In my 4+ years here, I've made some small efforts toward that end, but this translation gave me an unprecedented chance to help bring a particularly pivotal episode of Algeria's modern history to audiences outside the French-speaking world. The translator and author Jhumpa Lahiri once called translation "the most intimate form of reading," and getting to know Madame Drif—and the irrepressibly feisty warrior spirit that animates her as much in old age as it did in her moudjahida days—was undoubtedly the highlight of this experience for me. First, I was privileged to get to know her through my painstaking reading, re-reading, and re-interpretation of her text into my own mother tongue. But even more memorable were the long hours I spent sitting in her living room, sipping mint tea and—attempting to anticipate the questions of English-speaking readers who knew little or nothing of Algeria—inquiring about the meaning behind a certain word or about the context of a certain passage. She would respond with exhaustive explanations and fascinating accounts of moments, phenomena, or details from yesteryear (many of which she hadn't managed to squeeze into the original text). Back at home, I would ponder her answers, shaping and reshaping the sentences in hopes of conveying to readers not only the force of her words, but the very particular environment in which they took place: a land invaded over a century earlier, and subsequently colonized so profoundly that few on either side could even conceive of an independent Algeria. France had integrated Algeria not as a mere colony but as three full-fledged administrative divisions of its own country (like the US did with Alaska and Hawaii, for example). Yet it continued to deny citizenship rights to nearly all Muslim inhabitants, and brutalized and dehumanized them constantly and in myriad ways, small and large. This was the system Madame Drif and her fellow combatants rose up against; the reasons for and events of that uprising form the heart of her memoir. Earlier this decade, Madame Drif told me, she watched some of her closest friends, confidantes, and sisters- and brothers-in-arms began to disappear from this earth, and realized that the stories of their struggle risked disappearing with them, since so few had taken the time to record their actions and motivations for posterity. For her, the memoir (released in 2013 in the original French, followed soon after by an Arabic translation) was a way to ensure that future generations of Algerians would not live in ignorance of their history, and especially of the sacrifices that made it possible for them to live in an independent Algeria. Those stories are particular essential for Algerians, of course, but hold important lessons for many people in a world grappling with questions of identity, post-colonial trauma, claims of "just war", and other themes that the book raises. The translation, therefore, was her attempt to share her story with entirely new audiences, including many unfamiliar with Algeria's history. 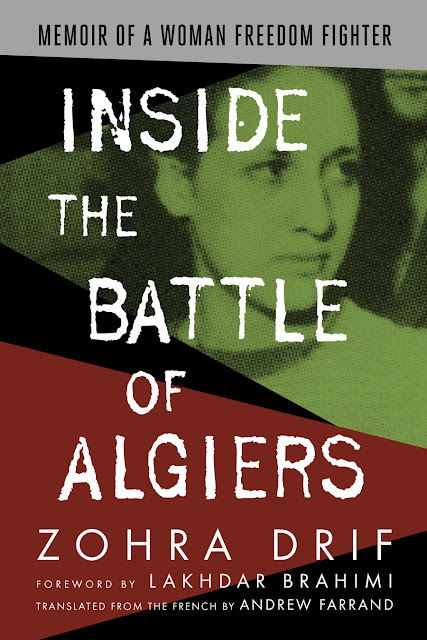 Inside the Battle of Algiers: Memoir of a Woman Freedom Fighter has just been released worldwide in paperback and e-book formats. Buy the book today via Just World Books, via Amazon.com, or via your local bookstore (US list here; UK list here). Following an exciting preview event hosted earlier this year by the US Embassy in Algiers, this month Madame Drif and I will travel to the US east coast for a book tour organized by the publisher's public outreach arm, Just World Educational. I will share full details of the book tour events here on the blog very shortly. For Madame Drif to put her story in the hands of this young American man with rather imperfect French and Arabic, and entrust me to translate it faithfully and carry its meaning and spirit to the wider world, was a true leap of faith. I am honored to have received her trust, and eternally grateful to my generous friends Leah and Khaled Bitat for suggesting my involvement in the first place. I hope the translation has met your family's expectations, and helps your story to reach new audiences and endure for future generations. I also owe a great debt of gratitude to Just World Books' Helena Cobban and her husband Dr. Bill Quandt, who took a similar leap of faith in trusting an unproven translator. Thank you also to Sarah Grey and Hugh Roberts for your invaluable reviews of the text, to Ambassador Lakhdar Brahimi for introducing it so well, and to Hillel Meddi for providing me critical early advice. Thank you to my parents for shouldering the burden of my very expensive education, and to my mother and sister for their encouragement from afar these last years. To Nina, for her steadfast support, patience, and aid through the many trying moments and grueling stretches of this process. To US Ambassador Joan Polaschik, for her ceaseless encouragement of this translation project from start to finish. And of course, to the French host families (the Kounines, Merriens, and Kupermans) and French teachers (Trish Swanson, Paul Buck, Cheikh Mbacke Cissé, Noureddine Jebnoun, and most of all, the magnificent Catherine Eiff) who first helped me learn what it means to discover a new version of the world and of oneself through a new language. J'espère que cette œuvre vous rendra fiers. And to the people of Algeria, who have taught me much in just a few short years—and who still have many stories to share with the world. Where to begin if not with Karima Kassi, my first and truest Algerian friend, who fielded my late-night vocabulary questions and translation dilemmas with dexterity month after month, in the same way she has humbly helped me to navigate her country's complex currents for years. Choukran bezzaf bezzaf, my dear friend. Thank you to all my Algerian friends and colleagues, who make every day interesting and unpredictable, every obstacle surmountable, every passing year more enjoyable than the last. Although you rarely believe me when I say it, I feel honored to live among you and learn from you each day. Buy Inside the Battle of Algiers today via Just World Books, via Amazon.com, or via your local bookstore (US list here; UK list here). Thanks a lot for sharing all this, very interesting! It makes me wanna translate my father’s memoir he wrote in Arabic a couple of years ago as he was a freedom fighter in the eastern mountains (maquis) in Algeria, he knows Mrs Drif and knew Mr Bitat. Thank you Andrew for your captivating blog, which I only discovered last night. I would love to know more about the book tour as I am based in New Jersey. @Amine Thank you very much, and hello from Algiers. Unfortunately the book tour has concluded, but the book is for sale at the links above and I would invite you to give it a read! Thank you for your interest. Thank you Andrew. I will be ordering my copy in English, so I can enjoy reading more of you. I would have liked to ask Mrs Bitat on her take of what become of her youthful hopes. I sometimes wish our "founding fathers" kept their ideals when establishing our institutions. I know you can't compare two very different nations but I sometimes wish we were as lucky as your country that let those idealists found the nation they dreamed to liberate. @Amine A big question! But a very interesting one. If I get a chance to ask her the next time I see her, I'll let you know her response. @ Andrew, if you are also interested in Algeria's post-independence history, please see below a link to a very interesting documentary film produced by the RTBF "Algerie mecque des revolutionnaires 1962-1974". @LS Yes in fact I saw this recently - a fascinating documentary! I would also recommend it to anyone interested in that period. It provides much food for thought and for debate :) Thank you.